FRONT ROYAL, VA — Confusion and cacophony go hand in hand as the GOP’s limps towards 2016. One perceives with a sigh the accelerating evaporation of core principles as the party struts and frets. Even less joyous is the distinct impression that the “conservatives” who should be resonating those core principles are abandoning them instead. Let’s face it. The Bipartisan Beltway Hot Tub is brain-dead. However, the decaying party’s limbic system hangs on to one innate reflex — that most primitive inclination common to even barely-sentient creatures: self-defense. That reality suggests that, should an outsider who hasn’t been baptized in the flowing waters of the Hot Tub promise to shut the water off — indeed, to drain it — mortal battle will follow. After all, the luxuriant lives of the Bipartisan Hot-Tubbers float gaily on that flowing water. Shut the water off? No way! And that’s why the only way to drain the Hot Tub is from the outside. The most promising outsider with a proven record of pulling the plug from what Stan Evans called the Washington “cesspool” is the governor who’s done it already. The progress that Scott Walker has achieved in Wisconsin has the Hot-Tubbers trembling — and for good reason. He knows where that elusive plug is hidden, and he will pull it. Mr. Walker is drawing cheers, and for good reason — but he is also attracting the faux “conservatives” who, since the early days of the Reagan Administration, have always hitched their careers onto “the horse they’re going to ride,” in the immortal words of conservative icon Morton Blackwell. President Obama has suggested that Governor Walker “bone up on foreign policy.” ...Perhaps Mr. Walker might suggest that Obama “bone up” on the Constitution. And right now, those fair-weather “fans” are riding Scott Walker right to the edge of a cliff — in the only terrain that he finds unfamiliar: foreign policy. These are the “experts” whose disastrous past has been conveniently shoved down the Memory Hole. Both party establishments depend on the billions that flow from the taxpayer into their war machine — with a generous percentage lopped off the top, of course, for its enablers. Because there is a much better way: it’s called the Constitution. This intriguing concept gives rise to another. Perhaps Mr. Walker might suggest that Obama “bone up” on the Constitution. After all, the Constitution is Walker’s strong point. As he enters the presidential field, the popular governor should defend it, keeping in mind a basic marketing principle: "Sell the Difference!" 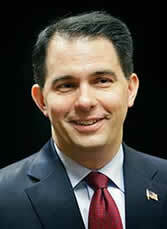 Walker has a sterling conservative record as governor. He doesn’t have to meddle in foreign policy’s muddy waters. Sharks abound there, spawned and nourished in the Hot Tub. Washington’s foreign policy establishment boasts countless bipartisan failures. Many have disgraced the presidents whom they served, some even convicted of crimes. If Governor Walker relies on these establishment zeroes, he will quickly become indistinguishable from the rest of the field, a choice target for the “gotcha” attacks that are sure to come. Of course, this badgering will be designed to distract Walker from his strengths — which his competition envies, but does not share. Once he gets bogged down deciding which country to invade first, Walker will meld into the mud, losing the critical support of the pro-Constitution, anti-Leviathan advocates of liberty who are his for the asking. If he abandons them, they will not go quietly. Will The Bright Spark Bring On A New Morn? Americans have rejected Washington’s free-spending lobbyist brigade that has captured the Republican Establishment. Governor Walker should confront it head-on. Here he can rely on two assets: first, widespread opposition to new wars; second, his independence from the Hot-Tubbers. After all, that besotted crowd considers Walker to be the real enemy — the Democrats are just the competition. Governor Walker can distinguish himself from the Republican field in three ways, which should become the indelible legs of a new “Three-Legged Stool” that will be the foundation of his winning coalition. First, emphasize his phenomenal executive experience, to which his competition cannot hold a candle. Walker is pro-life, pro-liberty, and pro-growth — and he has proven it. Second, challenge Congress to exercise its Constitutional powers, instead of fleeing them. It is with Congress, and not the Executive, that the authority lies to fund, or to defund, programs. It is the constitutional duty of Congress, and not the Executive, to declare war. Such a challenge will be truly bipartisan, for Congress has been chronically irresponsible under the leadership of both parties. Third, this challenge will enable Governor Walker to enter the foreign policy debate with strength, rather than weakness. After all, most members of both legislative chambers have ignored the Constitution as much as the president has. In particular, candidate Walker can guarantee an open national discussion, including full disclosure of the facts involved, before authorizing any military action abroad. He can insist that the Constitution places the responsibility to conduct that debate with Congress, and not the Executive. He does this for a simple reason, of course: he is the only candidate who can claim such positive accomplishments. Thus, his advocacy of the positive role of Congress, the responsibility all of us have to the Constitution, and his record as governor amount to a unique and unassailable candidacy. Will the Hot-Tubbers Throw Water on the Prairie Fire? Of course, the governor’s establishment opponents will try to "out-Romney" him. They support a strong defense! They will invade Ossetia! They will bomb Iran! Walker is weak and they are strong, they will cry. He is shallow, and they are deep! Walker can respond, with deft and devastating accuracy, that it is the Congress that has been weak, and its defense of the Constitution that has been shallow. The media will attack Walker in every possible way. The governor can easily point out that his primary opponents seem to agree with the liberal media. That’s all the folks back home need to know. “Sell the Difference!” Phenomenally successful executive experience; a demand for congressional backbone; and a strong defense of the Constitution: these three keys can carry Governor Walker all the way to the White House.